Grilling is a favorite activity in the summer, probably because barbecued food just tastes better. 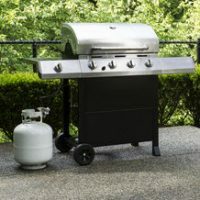 Nevertheless, around 5,700 grill fires happen on residential property each year, according to the U.S. Fire Administration. These fires cause 10 fatalities and 100 injuries. Many thousands more are injured because they burned themselves while at the grill. To protect yourself and your family, follow some simple safety tips. Look for holes or cracks in the grill hoses. Run water and liquid soap along hoses and connections. Then turn on the valve and look for bubbles, which will indicate gas leaking. Clear blockages with a pipe cleaner or wire. Make sure hoses are not in areas where grease might drip on them. Store your propane tanks outside and sitting up (not leaning on their sides). For adequate safety, remember to grill on a level surface away from buildings. Grills release carbon monoxide, which can be deadly, so even grilling in a garage can be dangerous. When you are done using your grill, properly cover it so that leaves and other debris does not fall on it. Put a fence around the grill so that small children cannot get near it. Avoid moving the grill after it has been lit. Keep pets inside while you are grilling. Dogs can knock down barriers or fences around the grill, and they can also knock children into the grill. Also remember to protect yourself while grilling. Remember that some material is flammable, including different sunscreens. Wear a heavy apron and mitts that reach up to your elbows. You should also use utensils designed for barbecuing. They should be sufficiently long that you do not need to get close to the grill while it is on. Burns are the primary injury from grilling accidents. Remember to apply cool water to a burn, by holding the burn under running water or applying a cold compress. If the burn is larger than three inches in diameter, or if it is in a sensitive area like your face or groin, you should immediately go to the doctor. Smoke inhalation is another problem, especially if you did not grill in the open air. Take someone who is choking, wheezing, or who cannot breathe to the hospital, where a doctor can apply oxygen to help them recover. Have you been injured by a defective grill? If so, you might be able to hold the manufacturer and others responsible for your injuries. At Earnhart Law in Delray Beach, our personal injury lawyers can carefully review the circumstances surrounding your injuries and check whether a defective grill is to blame. To start your case review, call 561-265-2220.